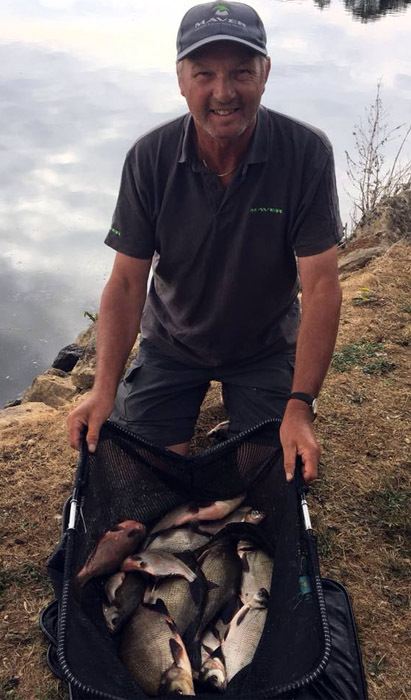 Tommy Pickering has booked his place in this year’s prestigious Feeder King Grand Final after winning the competitions latest qualifying round at Southfield Reservoir. The final, which takes place in September, will see thirty (30) of the UK’s top anglers go head to head for a winner’s purse of £10,000 and to be crowned the ‘Feeder King’. Tommy has now booked his place in this high profile feeder-only event in style by not only winning his twenty (20) man zone, but by winning the match overall on the day to boot on his first attempt! Below, Tommy reflects on a tough but rewarding visit to Southfield on qualifier number six (6) of the campaign. Tommy managed 17lb of skimmers on a difficult day to qualify for September’s Southfield Feeder Master final. “My latest outting at Southfield marked my first attempt to qualify for the Feeder Master final. Having not been for a while, I wasn’t sure how best to approach the match and, upon drawing peg 76, I didn’t hold out much hope to be honest. However, word on the bank was that’s where all the fish had been recently so perhaps I had a chance“? “I opted to start the match at 55m using a new prototype 12ft rod Maver are currently developing with a worm and pinkie laced groundbait mix. I started the match by introducing six (6) big feeder fulls in short at 15m before going long“. “I’ve not had anything for the first thirty minutes, but then found a couple of skimmers. I had Eddie Bridon one side and Joe Farell on the other. By this point of the match, I noticed they were both fishing shorter than me. They had started to catch and I, unfortunately, has stopped catching, which made for an interesting three-way head to head to see the match out“. “Come the end of the day, the scales made their way round and I’d done just enough coming out on top with 17-04-00 to win the zone and qualify for the September final“! “I’m absolutely made up and enjoyed a brilliant days fishing in great company. What a fantastic competition run by Andy and Mick. Really chuffed and looking forward to the final now“! “On to the next one now – a Maver Mega Match This qualifier at Maver Hayfield Lakes“. From everyone at Maver, well done Tommy! PreviousPrevious post:Success All Round For Sarah At WestonNextNext post:The Tyne Is All Mine!